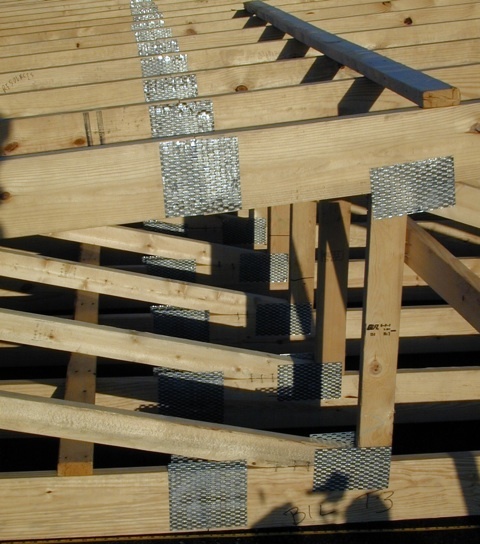 June is Physical Science and Mechanics Month at Make magazine, and about a week ago Gareth Branwyn of Make asked me to answer one of the Ask Make questions a reader sent in: How do roof trusses distribute the load? This topic is, in fact, right in my wheelhouse, so after some guidance on how long the answer should be, I wrote up a short piece and sent it in. Make posted it yesterday, and I decided to put it here, too, so I’d have my own copy. Trusses, like all structures, are devices for transferring loads from where you don’t want them to where you do. A roof truss takes the weight of the roof—and the snow on the roof if you live in that kind of climate—and transfers it out into the load-bearing walls of your house. A bridge truss takes the weight of the cars and trucks passing over it and transfers it to the piers. What makes a truss different from other structures—rafters, say, for a roof; or arches for a bridge—is the clever and efficient way it carries the load. 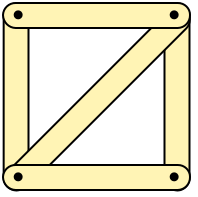 Trusses tend to be very lightweight because they take advantage of geometry and the laws of statics. This inherent rigidity of triangles is a geometric property. 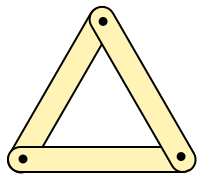 The triangle is the only polygon whose internal angles—and, therefore, shape—are uniquely defined by the lengths of its sides. There’s nothing like the side-side-side congruence postulate or the law of cosines for higher order polygons. The fact that the forces on each truss member are axial is the key to a truss’s efficiency. In an axially-loaded member, the force is carried equally by every part of the member—no part is wasted. 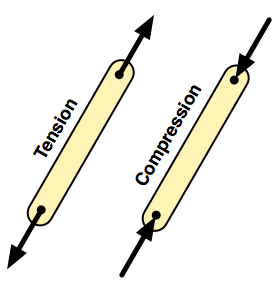 These deviations from the ideal do, in fact, generate additional stresses by imposing bending loads on the truss members. Fortunately, these additional stresses—structural engineers call them “secondary stresses”—don’t alter the truss’s behavior much and can be ignored in most cases. In trusses, the difference between theory and practice is small. Postscript: I made the drawings in OmniGraffle and exported them out as PNGs. OmniGraffle’s magnets, auto-alignment tools, and arrows made the job go quickly. The photo is mine, taken several years ago at a building collapse I was hired to investigate (I’ve done a lot of that over the years). 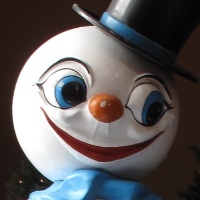 I couldn’t remember the name of the job, but I grep’d for “truss” in my directory of old job reports and soon found the job I was looking for. Flipping through the directory of photos from that job—most of which were of splintered truss pieces, which didn’t seem appropriate—I found what may be the only photo I’ve ever taken of an unbroken roof truss.